Some blogs on the web are money making machines that allow bloggers to bring in six figure incomes. Before getting to this stage, many bloggers initially take it as a hobby. I considered blogging as a hobby for a very long time. Just to be exact, it took me about a year to go from hobby to business, and I wasn’t making much money when I started (that’s true about any blogger). You may be on the fence right now still taking blogging as a hobby. It is great to start off treating it as a hobby because you need to enjoy blogging in order to be successful. There are tips to get more traffic and make money online, but if you don’t enjoy writing content, it is not going to work out. After you can consider blogging as a hobby, and you are eager to make the transition from hobby to business (that you still enjoy), here are the five steps you need to take. When you first start out as a blogger, it is important to avoid settling with one blog right away. Although there are some people who know what they want to write blog posts about since day one, there are other people who make big changes. I wrote blogs and blog posts about the Red Sox, Yugioh Cards, and Legos before I started this one. If I settled with the Red Sox blog, you would not be reading this blog post right now. I refused to settle with one idea until I created this blog. It is okay to have dozens of blogs before finding the best niche for you. When you identify your main blog, you have the option of using your other blogs to test out particular plugins, themes, or code before applying them to your main blog. Once you identify your main blog, you need to solely focus your time on that individual blog. When I first started this blog, I was still updating my Yugioh Philosophy Blog because I had no idea how far this one would go. As a result, I was writing one blog post every day for the Yugioh Philosophy Blog and one blog post every day for this one. It was only when this blog started to get more traffic than the Yugioh Philosophy Blog that I paid my undivided attention to it. As a result, I did not write another blog post on the Yugioh Philosophy Blog, and I was able to write two blog posts every day for this one (I have stopped since then because when I say two blog posts per day, I am referring to 250-500 word blog posts). The strategies I use to promote this blog change, but the blog I promote is always the same. Don’t try to juggle responsibilities for multiple blogs because you put all of that time into one blog, and provide more value to your readers. If you insist on having multiple blogs, my recommendation is to still focus on one of them until it brings a full-time revenue. Then, create another blog and have contributors for it. Neil Patel does this very well with his Quick Sprout, KISSMetrics, and Crazy Egg blogs. The reference to Neil Patel earlier is the proper segway for looking at the leaders of your niche. I examined the leaders of my niche so I could learn new information, what works, and what does not work. Neil Patel has multiple blogs that get over 100,000 visitors every month, and I read through many of the Quick Sprout blog posts. In addition to Neil Patel, I also read what Jeff Bullas, Kim Garst, and others put on their blogs. Seeing how the leaders of your niche are writing blog posts will give you ideas for your own content. The best way we learn is by example, and by looking at enough successful bloggers in your niche, you will be able to learn from the best examples available. One of the main reasons why most people get stuck at the hobby stage is because they are not writing valuable content often. Some bloggers write inconsistently. On one month, these bloggers are able to write 10 blog posts, but the next month, these bloggers only write two blog posts. This inconsistency indicates that blogging is still a hobby. In addition, the content you post needs to be valuable. I could have ended this blog post a long time ago if I chose, but then it wouldn’t be as valuable. I could have simply mentioned the first three steps and then scheduled the blog post. However, extending the blog post to include other steps and examples increases its value. Instead of writing a blog post just to say that you wrote one, write a blog post that you know your targeted readers will enjoy. Most of the blogs that are bringing in the six figure incomes are doing so with products. There is the rare exception in which ads are bringing in a bulk of the revenue, but ads are the exception, not the rule. Most people cannot make a full-time income with advertisements just because a blog would need to be getting over 100,000 visitors every month to have a good shot at it. Instead of relying on advertisements, you need to create your own products. The web has made it incredibly easy for us to write books, launch training courses, and create membership sites. All three of these products have the power to bring in six-figure incomes. Some of the people have used these products to make millions of dollars, and that is not an exaggeration. Creating your own blog is a great way to get more traffic and spread awareness for the products that will bring in the revenue. Blogging is a fun experience that can also turn in big profits. 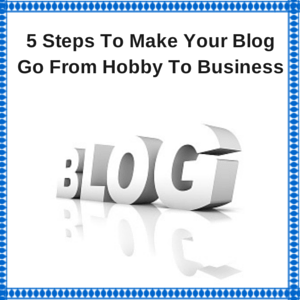 Some people make six figure incomes just from their blogs, and in order for you to start making revenue with your blog, you need to go from hobby to business. You can still enjoy writing blog posts when you make this transition, and this love for blogging is critical towards your success in the area. Blogging success is never an overnight success. For most bloggers, it takes several years before they get the type of traffic associated with a full-time income. However, blogging success is possible, and it has transformed some people’s lives.